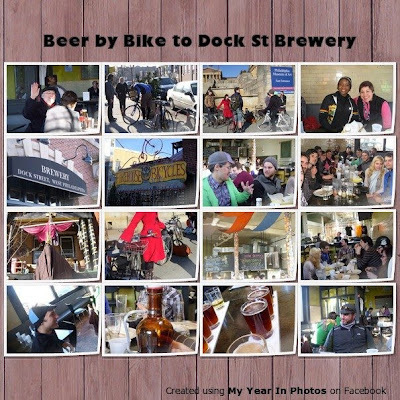 I had fun and did something I've never done before this past Saturday, January 23rd - I joined a bunch of folks I've never before met and went on a Beer by Bike excursion to Dock Street Brewery. I learned about this monthly bike ride about a year ago from someone I met during one of my Bicycle Club of Philadelphia Rides. Someone mentioned to me that there is a blog called Bike by Beer and the premise is that this guy, Jesse, organizes a bike ride to a local Philadelphia Tri-State area brewery. He and his friends Twitter, blog and I presume, Facebook about a meet-up time and place and destination and then on the choosen day, people bike out to a local brewery. Past rides have included going to breweries in places such as Downingtown, Germantown, and Cherry Hill-New Jersey. Either I've had to work or other plans, or family things have come up, like, say, having a new baby! This past weekend was the first ride I was able to do and it was an absolute delight. The meet-up was at 11 am at the Art Museum steps. About 12 people arrived and we set off around 11:30 am. It was an eclectic group of riders - college students, serious riders, cyclists on vintage rides and super high end road bikes. The age range was from 19 to 43 - with me being at the oldest end of the spectrum, an almost 43-year old mom! We rode through Fairmount Park, around the Japanese Tea House, Memorial Hall/Please Touch Museum, up Belmont Plateau and through Girard Avenue into West Philadelphia by way of Ossage Avenue and Powelton. It was a crisp sunny day, perfect for biking and rewarding one's self with a pizza and a beer at Dock Street Brewery in West Philly. I have not been on my bike in over three months, and I was feeling every bit of my not being in top riding shape. Some of the hills we rode up were truly killing my legs. It was a real eye opener for me to see how quickly you can fall out of shape - but the point of the ride wasn't to be competitive, it was about meeting new people, enjoying the thrill of biking and heading to one of the many local breweries in our part of the country. What I loved most about this ride was the camaraderie and the ease of joining such a varied group of new people. I have ridden with people I know on trips, gone out on my own and met new people, or have gone on bike rides completely solo. Depending on my mood, each ride can be wonderful, but this past Saturday's ride was definitely one of the highlight rides of my biking experiences. I felt so welcome and accepted. There were many great conversations and great food and awesome beers. I truly look forward to having the chance to do this again. Thanks Jessie - your friends are amazing! I'm glad you made it out! Sounds like a fun time. I'm sad to have to have missed it!